Welcome to Tropical Trail Rides.com / The Best Horseback rides in Puerto Rico and the Caribbean. 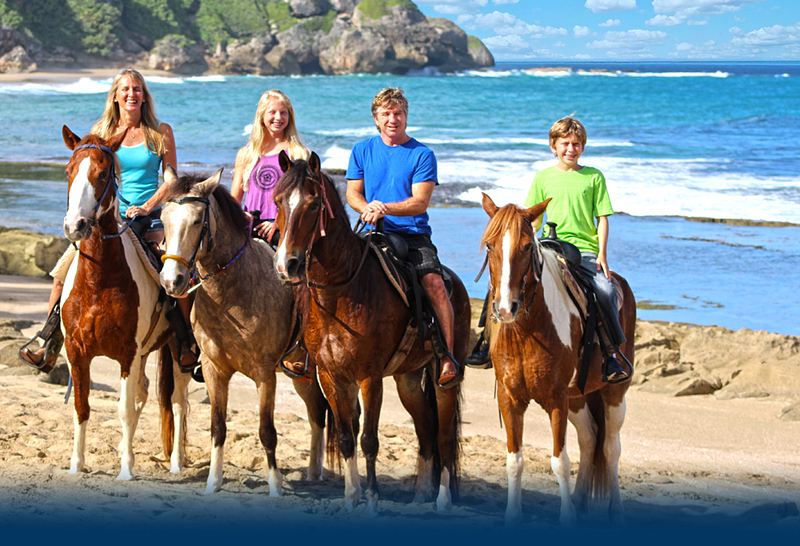 The Barker Family awaits at Tropical Trail Rides to serve you. Here at Tropical Trail Rides we offer a variety of possibilities for your horseback riding adventure. We operate 7 days a week with 2 rides daily. The morning ride, at 9am, is a perfect way to start your day. Or if you prefer, you can see the best sunsets on the 4pm tour. Each tour lasts approximately 2 hours, and it’s amazing what you can do in those 2 hours! We cater to groups or individuals. Inquiries into specialty rides are welcome. We have 30 horses available and our horses are well cared for, very gentle, but spirited! We take pride in the health and happiness of our animals. We start off our tour with a nice ride along the beach (and how many people have had that fantasy?). With the soft sand and beautiful blue waters around you, it’s hard to not appreciate natures beauty. We here at Tropical Trails are not interested in bustling people through, we want you to enjoy what our island has to offer. This is not a commercial endeavor, but more of a personal experience. This experience is sure to give even the most timid rider a new found confidence! Hey, but the beach isn’t all there is to see! A nearby Almond Tree Forest also makes a great horseback riding trail ride as well; With the contrast of ocean blue to lush tropical green, this tour really tickles the senses; There is definitely enough variety in the landscape and terrain to challenge the more advanced riders. But we also take pride in giving Beginner and Intermediate horseback riders the same chance to enjoy this spectacular trail ride as those more advanced horseback riders. With a brief orientation to the horses and riding, and with our trained tour guides. Lets take a moment at the end of the beach to pause and let the horses rest for a minute. One of the neatest things about our tour is something that we do off the horses. For those who are able, we take you on a brief hike up the cliff and allow you to see the exquisite panoramic view. Take the cameras, this vista needs to be captured on film! But if you’d rather take a more relaxed approach to the break you can either go for a refreshing swim, or check out these cliffside caves. The caves are not huge caverns, but with their easy accessibility, it is sure to be a place the whole family will enjoy.